March 15, 2018 This post may contain affiliate links. 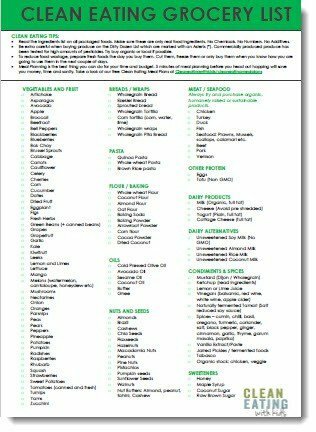 This Clean Eating Grocery List can be printed out and used as a guideline when stocking your Kitchen. Obviously, you don’t need to purchase everything on this list. Try and build up your pantry supplies over time as you need them rather than going out and buying it all on the same day. Read the ingredients list on all packaged foods. Make sure these are only real food ingredients. No Chemicals. No Numbers. No Additives. You can get the full list of 12 Clean Eating Rules here. Be extra careful when buying produce on the Dirty Dozen List. Commercially produced versions of these items have been tested for high amounts of pesticides. Try buy organic or local if possible. If neither of these are an option then look in the frozen produce section. To reduce food wastage, prepare fresh foods the day you buy them. Cut them, freeze them or only buy them when you know how you are going to use them in the next couple of days. Meal Planning is the best thing you can do for your time and budget. 5 minutes of meal planning before you head out hopping will save you money, time and sanity. I keep all my printables and downloads in my Exclusive Resource Library. Click here to access them all for free.